I wonder if Mary thought of her journey to the Judean hill country as a pilgrimage. Pilgrimage can be a solitary journey, but is often a group of individuals on a common quest. Lasting bonds form and extraordinary effort is expended to make sure that the weakest share in the collective spiritual experience. It’s not just any journey. Senses are alert to the God- promise that something special is occurring. When the scriptures say that Mary travelled to the hill country, they describe one of the few biblical tour sites inaccessible by large vehicle. On a Holy Land pilgrimage in 1998, the bus parked at the bottom of the hill, and pilgrims began the climb up the steep, narrow road to the Church of the Visitation. As we climbed the hill slowly, my mind was on a pregnant teen climbing the hill to visit her relative--propelled onward by her excitement and desire to share her joy with another mother-to-be. Pilgrimage can wrap you in a solitary encounter with God while surrounded by the members in your group. It is possible to remain deep within yourself—watching, waiting, attentive to the mystery around and within. I wonder if Mary sensed the impact of that first meeting of the two central figures of the inception of Christian history and how their lives and ministries would entwine. We have been listening to the scriptures of John as herald—the call to preparation, the call to repentance, the call to rejoice at the great coming of the Messiah. I wonder what Mary felt as the two children grew up…was she looking for signs of God’s working in their lives…did she remember this first encounter when told of John’s ministry and then of his death. 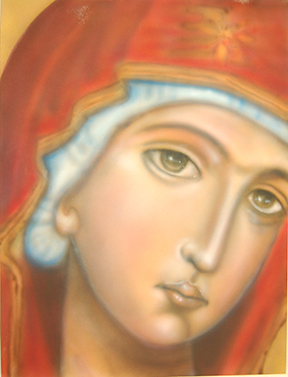 I wonder if Mary’s normal demeanor was reflective and attentive to God’s message within her. She is the great model of pondering—yet here she is spurred into action as a response to the angel Gabriel’s good news about her relative, Elizabeth. The word “pondering” brings with it an aura of patience, discernment, taking time to extract meaning and purpose. Here Mary’s action is an exuberant one, and perhaps, the joy of two mysterious and God-graced pregnancies calls for the immediacy of this meeting between the God-graced mothers. The scriptures do not discuss the practicalities. Did she make plans for her absence? What has she brought with her? I like to think of the spontaneity of grabbing a change of clothing and a few provisions and heading out. I wonder if Mary ever had doubts. Mary’s story has always been to me one of wonder and many questions; I marvel at her ability to say yes amid so many risks, and her chutzpah in heading out solo to this rather remote area on her own. There is wonder in the interaction between two pregnant women. This is the indefinable bond between two women sharing a secret and the unarticulated hopes and dreams they each have for the child they carry. The scriptures tell us that Mary knew of Elizabeth’s impending birth—I wonder if Elizabeth also know that Mary was pregnant before her arrival or if John’s response signaled Elizabeth’s awareness of Mary’s blessing? Advent continues to call us year after year to this same journey, yet with each passing year it looks different. Our experiences shape our future response. We carry memories within ourselves that are not always accurate, our memories and realities shift over time. When I was a child we spent a week’s vacation each year at a cabin on a lake in Wisconsin near where my mother grew up. The trip there was a journey, but not a pilgrimage. This journey involved packing a picnic lunch along with everything we would need for the week—food, clothes, inner tubes, fishing gear—the dog. We often travelled slowly along a major highway shared with a convoy of military vehicles travelling to or from manoeuvers, stopped to pick up my aunt and continued until the road turned to sand and we could see the sparkling water of the lake. The lake seemed huge. Yes, we could walk all around it, but it seemed to take forever. Sometime around junior high, our vacations took on a different character, and we no longer rented the cabin on the lake. I made the mistake, during one vacation from college, of making a trip to the lake to show friends my treasure. I shouldn’t have gone—for in place of those idyllic memories was the reality of a small, pondish body of water ringed by a few dozen cabins---not at all what I remembered. I wonder…and these encounters were full of wonder.